The official Gene Autry biographer, Holly George-Warren, summarizes the history of the song Here Comes Santa Claus (Right Down Santa Claus Lane) in her book Public Cowboy No. 1: The Life and Times of Gene Autry. Another Autry recording marked a turning point for the singer in 1947. That summer Art Satherly had suggested Gene record a new Christmas song he had discovered, "An Old Fashioned Tree." For its flipside, Gene remembered a song idea he'd gotten while participating in the annual Hollywood "Santa Claus Lane" parade the previous November. Astride Champion Jr., ahead of St. Nick on his sleigh, he'd heard a child on the sidewalk shout, "Here comes Santa Claus!" 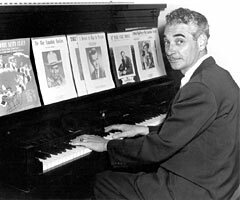 Satherly took Gene's idea to Oakley Haldeman, the composer who operated Gene's music publishing division, and he came up with the melody. Johnny Bond recorded a demo version of the song at his home studio, where Art, cocktail in hand, stood next to the mic (as he usually did during recordings). The tingling of ice cubes was captured on the recording, inspiring the use of jingle bells on the August 28 Columbia session. 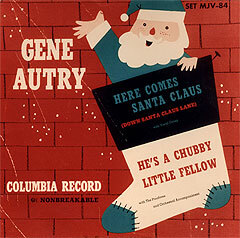 After initial sales of two million following its December release, "Here Comes Santa Claus (Right Down Santa Claus Lane)" became a perennial top-ten hit every Yuletide season for years to come. More important, it opened up a whole new market for Gene  holiday discs aimed at children. Easter and Thanksgiving recordings would follow, as would one of the biggest-selling Christmas discs of all time. © 1947, Renewed Gene Autry's Western Music Publishing Co. Here Comes Santa Claus (Right Down Santa Claus Lane) co-writer Oakley Haldeman. 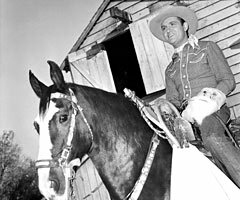 Here Comes Santa Claus (Right Down Santa Claus Lane) co-writer Gene Autry with Champion ready to deliver Christmas gifts circa 1947. This recording of Here Comes Santa Claus (Right Down Santa Claus Lane) is a Gold Record. Released on the Columbia EP Christmas Fun. if we just follow the light. ©1947 (Renewed) by Gene Autry's Western Music Publishing Co. This special set of original sheet music from Gene Autry's music company archives includes individual sheet music of six Christmas songs, including Here Comes Santa Claus (Right Down Santa Claus Lane). This song book, with the charming Gene Autry Christmas cover illustration by Chuck Saxton, includes sheet music for seven Gene Autry’s Western Music Publishing Co. Christmas songs.